Pupils from Saint Matthias’ Church of Ireland National School, Ballydehob, County Cork were among the top scorers in a recent international informatics challenge in which three-quarters of a million other school-children took part from over 40 countries around the world. 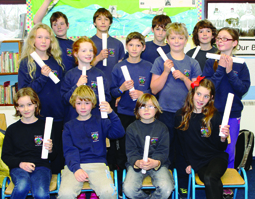 Thirteen of the Ballydehob schoolchildren took part in the ‘Bebras Challenge’ online. ‘Bebras” is a problem-solving challenge with a focus on computational and logical thinking.and which introduces Computer Science to students. The programme is designed to get students excited about computing. It also aims to identify and encourage students who may have a talent in the area of computational thinking. One pupil from the small West Cork school scored in the top 100 around the world and three scored in the top 2,600. Six others scored in the top 3,600, while the remaining six achieved an above average score. Their success reflects the talent of the pupils involved and the emphasis that is placed on information technology within the school. This entry was posted in Diocese, Education, Parish News, Schools in the Diocese. Bookmark the permalink.